always as many options as we'd like for interesting diet-friendly morning meals. What we think of it: The wrap is very good. 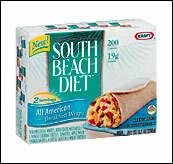 It does, however, have that typical salty Mexican frozen food item flavor -- so if you really go for that, you'll love it. It's one of the lower-cal wraps as far as fat, calories and taste are concerned, so you get a lotta bang for your buck out of this one. Would we eat it again? Sure! What we think of it: Yum! We applaud this awesome wrap. It's PERFECT! Not only does it taste extremely fresh (like you picked the veggies right out of your own garden), but it's not overly salty at all. The Denver wrap is our overall top pick. With 180 calories and 7g of fat, we think it's the calorie bargain of the century. Would we eat it again? Yes! Repeatedly. What we think of it: In all honesty, this is the least-exciting one of the bunch. Not because it's bad, it just had little flavor to it. And, believe it or not, even though it's packed with 430mg of sodium, it actually tastes like it needs salt. The mushrooms and basil are good, but they just don't do enough for it. Heads up: If you don't like mushrooms you won't like this wrap. Would we eat it again? Only if all the others were sold out. What we think of it: With 200 calories and 9g fat, this is the least diet-friendly wrap in the line. It is, however, the BEST tasting one. It's soooooo delicious that it may in fact be worth those extra calories (and that extra one point, if you count). The applewood smoked bacon tastes a bit sweet and works really well with the melted cheese. Mmmmmmm! Would we eat it again? Heck yes. 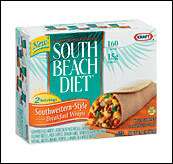 -These wraps are pretty high in sodium. So sodium-counters, they may not be for you. -Though they aren't terribly large, these low-cal wraps (thanks to that wheat tortilla) are PACKED with fiber, so they're actually pretty filling. And they're low enough in calories that you can fill out your breakfast with some fruit or a few ounces of lowfat yogurt. 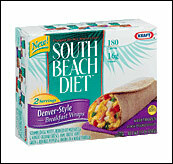 -You actually microwave these pouches of breakfasty goodness in the plastic wrap, which we found somewhat curious. But the really odd thing is how the box instructs you to "remove from pouch before eating." Anyone who doesn't know enough to avoid eating the plastic probably shouldn't be trusted around a microwave. Don't you think!? -Oh, um, we were not paid to write this. None of the products featured in our editorial are paid for. All ads are clearly marked. Click here for more details on this. Today, January 13th, is National Peach Melba Day. Make HG's famous Peach Crumble instead. Share these chew & tell reviews with everyone in your address book. Click "send to a friend" NOW!